The flood of pictures last week should have given a good picture of what CeBIT is all about, so we'll keep this intro short. 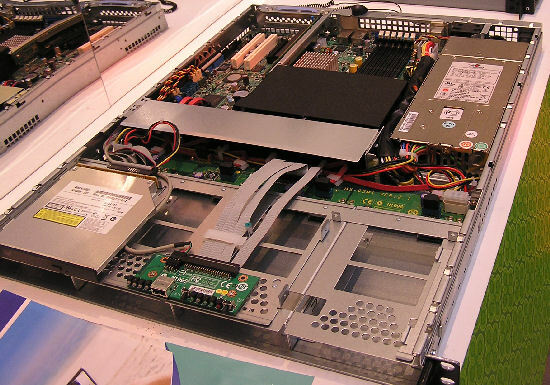 In this article, we'll look at a few of the servers that we saw on CeBIT. Almost all our attention goes to the so-called "Tier-2 vendors", as the Tier-1 vendors were mostly focused on the local market and less interested in the international press. The theme of this year CeBIT was "green IT". It is of course highly disputable whether the incredible amount of energy that datacenters consume can ever be considered "green". Nevertheless, it is clear that current datacenters are grossly inefficient as only a small percentage of the energy is used to do the actual processing of data. One of the latest victims of the continuing search for more power efficiency is the FBDIMM. Every single server vendor was proudly showing Xeon servers with DDR2 DIMMs. FBDIMM based servers were still there of course, but they were much less in the spotlight. Although 1.5V FBDIMMs have lowered the per DIMM power consumption from 15W (1.8V) to ~12W, they are still a lot higher than the typical DDR2 DIMM (6-8W). The next victim is the massive server power supplies. Just a few years ago, a typical server power supply (e.g. 800W) was about twice as powerful as a desktop power supply (400W). Nowadays, it is almost the opposite as you see in our PSU/Case CeBIT Report. Power supplies from 700 to 1000W are now quite common in desktops, while many dual-socket servers we saw were equipped with 300-500W PSUs. The only 1000W+ PSU we saw was on an eight-socket quad-core system, in a blade chassis of course. However, you can hardly call two 1400W PSUs used to power 10 to 14 (!) servers overkill. MSI had some success with their half-length 1U barebones chassis. These typically single-socket systems are popular for web servers and firewalls, but the K2-105-A2M can do more. 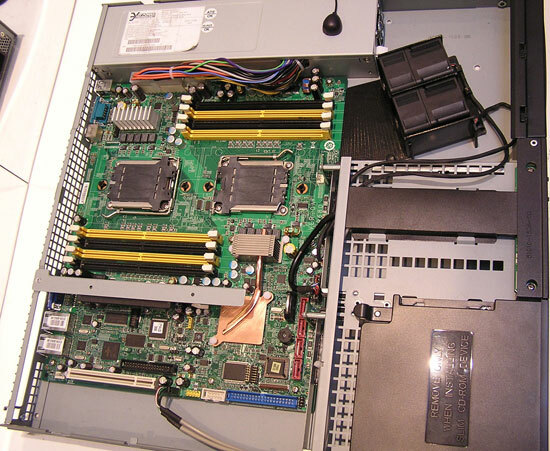 MSI was able to fit two quad-core Opteron 23xx CPUs into this tiny chassis, together with eight DIMM slots (max. 32GB) and one PCI-E x16 riser card. The only thing left on our wish list is more Ethernet ports, although two Gigabit ports are available. This kind of server only uses internal storage for the boot device; two hot swappable SATA disks should do that job nicely. Also, note the tiny heatpipe that keeps the PCI-E tunnel and Southbridge cool. The MSI X2-109-A4M features two Xeon sockets connected to Intel's latest 5100 MCH with DDR2 and Xeon 54xx (Harpertown) support. Unfortunately, Intel cripples this chipset - for strategic reasons - to three DIMMs per channel. That means this server is limited to six DIMMs or 24GB of RAM. Although the chipset can support 48GB (6x8GB), it is not realistic to expect ultra expensive 8GB DIMMs in an entry-level or midrange server.